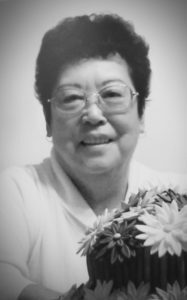 SHIZUE “SUE” KADO of Magrath, A lberta passed away peacefully in Lethbridge on August 4, 2018 at the age of 87 years. Sue is survived by her children, Kelvin (Lennie) Kado; Vicki (Ron) McKenzie; and Mona Kado (David Staines). Sue enjoyed a close, special relationship with each of her surviving 10 grandchildren and their families: Candi, Arlee and Marla Greenwood, Braden and Keylan Kado, Graham and Kimiko McKenzie, Yoshio and Shoji Blunderfield, and Kieran Staines. 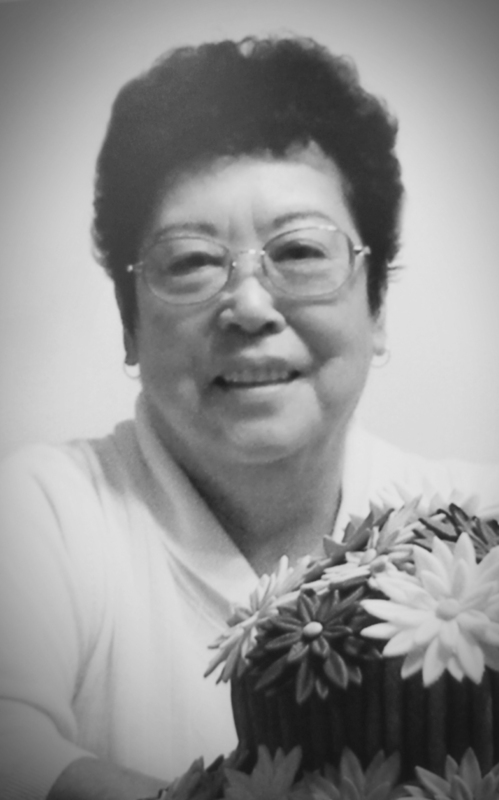 She is also survived by 17 great grandchildren and her sister Sumiko (Marjorie) Hikida. Sue was predeceased by her husband Yorio Kado, parents Shoji and Midori Saga, sister Miyo Saga, brother Hideo (Sid) Saga, and cherished grandson Dallas McKenzie. Sue was born November 2, 1930 on Mayne Island, BC. As a young child she travelled twice with her mother to Tottori-ken, Japan, receiving her primary education there. They returned to Canada in 1940 and shortly after were forcibly relocated from their life and livelihood in the Gulf Islands to the sugar beet fields of southern Alberta. Her family received notice they were being sent to Magrath and arrived in the spring of 1942. Throughout her life Sue demonstrated incredible resiliency and persevered to create a comfortable life for her children and parents. Sue was proud to call Magrath her home for the next 76 years. She graduated from the Magrath High School where she was active in sports, playing on the women’s basketball team, and competing in local beauty pageants. She met and married York Kado in 1956, worked at a variety of jobs, including the Magrath Medical Clinic, until the young couple purchased and operated a Texaco gas station and garage on main street. After losing her husband very early to cancer, Sue returned to banking. She worked at the Bank of Montreal for a total of 23 years and the final 15 years of her career was as the branch manager of the ATB. Sue was widely respected as one of the first professional women in town and as a community leader. She believed strongly that we have a duty to give back to our communities. Over her lifetime, she volunteered with more than 30 societies and not-for-profit groups in executive positions including treasurer, director and president. Sue donated her time and skills to complete financial audits and tax returns for numerous individuals and groups into her early 80’s and served as an electoral officer for every municipal, provincial and federal election. Sue was able to return to Japan several times, enjoyed travelling to the west and east coasts, Hawaii and overseas. She loved to organize and go on seniors’ bus trips. She had a cheerful, outgoing personality, loved to play games, became an avid bowler and card player, all resulting in an abundance of close friendships throughout her life. Our mother was an extraordinary woman and will be missed by so many. The family would like to extend our sincere gratitude to the numerous doctors, nurses and staff at the Lethbridge Regional Hospital. A special heartfelt thank you to Drs. Zielke and Klassen for their professionalism and sincere compassion and all staff at St. Michael’s Palliative Care. At Sue’s request, a private family service will be held at a later date. Flowers, food and koden are gratefully declined. If you wish, please donate to the charity of your choice.